It’s summer in Canada, and that means we will soon be enjoying nature’s bounty at our local farmer’s markets, grocery stores, or if we’re lucky enough, straight out of our own gardens. While peaches remain my favourite local produce, I hold a soft spot in my heart for beets (or, more accurately, beetroot – the bulbous part of the plant that comes out of the ground). I love beets not only for their vibrant colours (candycane beets are a favourite in our household) and Earthy taste, but I also get a real kick out of the health and performance benefits they have to offer. Put simply: beets are fascinating little guys! Surprisingly (to me, anyway), beets are actually pretty modest in their vitamin and mineral makeup (when I see their rich colour, I expect to see huge numbers, but as you can see below, that’s actually not the case). 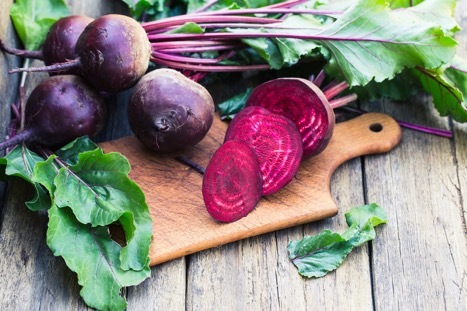 What makes beets standout, nutritionally-speaking, is their nitrate content. Yes, nitrates: the oft-demonized additive found in cured meats, like bacon and bologna. While nitrates added to smoked and cured red meats are associated with an increased risk of certain cancers (it seems the combination of the nitrates, along with the heme iron and other compounds in red meats, are the issue), it turns out that nitrates that naturally occur in vegetables (which include not only beets, but also spinach, celery, and rhubarb) seem to be health promoting: for example, numerous studies have demonstrated that dietary nitrate consumption can be associated with lower blood pressure and improved cardiovascular function. Whether for blood pressure or sport performance, nitrates exert their beneficial effect when they are converted to nitric oxide (NO). When we eat nitrate-rich foods, the nitrates are liberated in our intestine, and then transported through something known as our enterosalivary system back to our mouth (weird, I know – they just left there! ), where bacteria converts them into nitrites (note the small difference in spelling). The nitrates are then swallowed, and then transported to tissues in need, like hard-working muscles, where they are converted to NO. Nitric oxide is a small, short-lived molecule that relaxes the walls of our arteries through a process known as vasodilation, helping to increase blood flow to the local tissue. Relaxed blood vessels and more efficient blood flow not only translates to better blood pressure control, but it also allows for more oxygen to get to our hard-working muscles during exercise. That’s a nice story, Jen. But does eating beets work really work in practice? 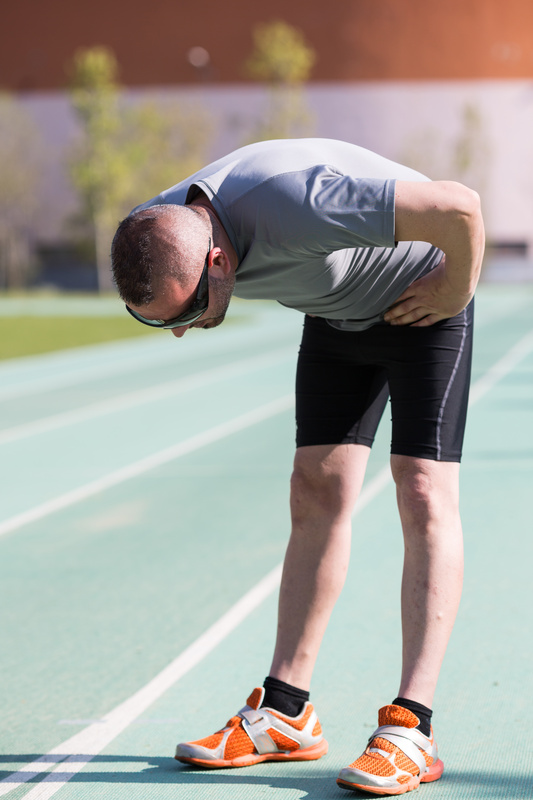 A number of studies have examined the effects of taking dietary nitrate supplements on sport performance, and many have had promising results. But what about the effects of real food? (We are, after all, talking about beets here). This question was addressed by researchers who gave a small group of recreationally fit runners 200 grams (a little over a cup) of cooked beetroot about an hour before a 5 km time trial run (meaning, the participants were asked to run 5 km as fast as they could). The participants who ate beets not only had a higher average running speed than the participants who didn’t, but they also reported a lower perceived exertion during the run (meaning they found the run easier after eating beets). Great. So now you’re saying I have to eat beets every time I want to have a good workout? While the results of this study are intriguing, there is one obvious limitation: you would actually have to down a half-pound of beets an hour or so before you run. And while I like a good beet as much as the next guy, let’s get real: that’s a lot of freaky-red beet pee. So, if you’re not into chowing down on beets every time you hit the road, don’t sweat it: a more recent study examined the effect of eating an overall diet high in nitrates on exercise performance, and the results were promising. In this study, participants were assigned to either a diet high in nitrate-rich vegetables (including arugula, collard greens, red beetroot, spinach, and celery), or one that contained an equal amount of lower-nitrate veggies. After a week, the participants completed a moderate-intensity steady cycling effort and 5 consecutive all-out sprints. The result? The subjects that ate the high nitrate diet had a lower level of oxygen consumption during exercise (an indication of being more efficient while cycling), and were able to sustain a higher peak power during the last 3 of 5 sprint efforts. Translation: They were able to work harder while using less oxygen versus those who ate a lower nitrate diet. Can beets – or nitrates – help every athlete? That’s less clear. While studies on moderately-trained and recreational athletes have generally been favourable (yay for me! ), research on elite, or very well trained athletes has been less convincing (boo for them!). It’s possible that high level athletes have already maximized their ability to use oxygen, rendering the added nitrates less useful than for weekend warriors, though it’s possible that some elites do respond to nitrates better than others. What if I still don’t want to eat beets (or veggies, for that matter)? If you’d rather get your beets from a supplement, there are several products on the market. Beet It, a drinkable beetroot shot, contains the amount of nitrates available in 2.5 cups of cooked beetroot, while Beet Elite contains the equivalent of 6 whole beets. Just be sure not to use mouthwash or chew gum after drinking beet juice: as mentioned, part of the conversion of nitrates to NO occurs via bacteria in your mouth, and mouthwash abolishes them. Alternatively, if you want to enjoy the nutrition of beets without having to eat them as part of a meal, try adding a peeled, uncooked beet to your favourite red smoothie for an even more vibrant colour. Raspberries work well to complement the beets’ earthy flavour. How do you prepare beets? Cut off the greens and boil with the skin on until soft. Once cool enough to handle, peel skin off with a knife or your fingers. For a simple side dish, cut into medallions and serve drizzled with olive oil, balsamic vinegar, and a sprinkle of salt and pepper. You can also roast beets in the oven (or on the BBQ) with olive oil, a bit of salt and pepper, as you would any root veggie (I like them with sweet potatoes and rutabaga). Trim beet stalks. Peel and then cut into 1/2 inch cubes. Place onto a foil-lined baking sheet and drizzle with olive oil and balsamic vinegar. Sprinkle with sea salt and pepper and toss. Place into the oven and bake for 40 minutes (or until tender), flipping the beets after 20 minutes. Remove from the oven and let cool. In a small bowl, add olive oil, balsamic vinegar, maple syrup, garlic, salt and pepper. Use a fork to mix until well combined. In a large salad bowl, toss the arugula with the dressing. Top with roasted beets, goat cheese, and pumpkin seeds. Season with salt and pepper and serve. Last week, I presented at the PANEX Conference in Toronto. I sat on a panel with Dr. Stuart Phillips of McMaster University, along with Dr. Trent Stellingwerff of the Canadian Sport Institute Pacific. I’ve know both for a long time: Dr. Phillips was my first-ever nutrition professor at McMaster (I was studying biochemistry, but was interested in making the switch to nutrition, and he taught one of two courses in the area), and he even wrote me one of my reference letters to get into grad school. Trent and I shared lab space in graduate school together at the University of Guelph, and to this day work closely in a number of areas, including athletics, where he heads up our national Integrated Support Team, and triathlon, where he works in physiology, and I work in nutrition. Yet despite having regular interactions, and having seen both present a number of times over the years, I still manage to take something new away every time I see them talk. In this case, I was particularly struck by a slide Trent posted that was derived from his work with the world-famous distance-runner, Haile Gebrselaisse. If you’re not a track or marathon enthusiast, no problem: Gebreselaisse’s records speak for himself. He is a two-time Olympic gold medallist, a four-time world champion (in both cases, in the 10,000 m run), and set the world record in the marathon twice, most recently in 2008 at the relatively senior age of 35. His latter record stood for three years. To this day, Gebreselassie is regarded as one of the greatest-ever long distance runners. Trent is not only a world-class talent in exercise physiology, he also knows a thing or two about nutrition. And in 2008, he was fortunate enough to be part of the team that helped Gebrselaisse set the world record at the Berlin Marathon. 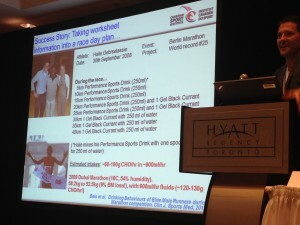 Trent was kind enough to share the details of Gebrselaisse’s sports nutrition plan for the race as part of his presentation at PANEX, and the results might surprise you (they surprised me). There was no witch-craft, no trade secrets, no sneaky new technology to help the Ethiopian run faster than any human before. To win Berlin and set the world record, Gebrselaisse drank about a cup (250 ml) of sports drink every 5 km. From the 20 km mark and onward, he added a sports gel every 5 km (apparently, he likes black currant). And that was that. All told, he took in 8o to 100 g of carbs, and 900 ml of water per hour. So, what can we learn from Mr. Gebrselaisse? For me, it was a big reminder that carbohydrates fuel fast performance. In a world where carbs are seen as the enemy, and sports drinks are seen as poison, Gebrselaisse’s sports nutrition plan speaks for itself. To run at the unfathomable speed that he and other world-class marathoners run, they simply cannot rely on slower-burning body fat stores. In marathon and ultra-marathon distances, teaching the body to rely on fat, rather than carbs, is becoming more popular. The premise is to move the athlete towards a low-carb, high-fat diet, which eventually helps the body to adapt to burning more plentiful body fat stores during endurance performance (while our body only stores enough carbohydrate to get us through about 2 hours of intense activity, even a lean athlete has enough fat stored to get through a day or more of running). Moving away from carbs allows the athlete to divorce him or herself from the need for sugary sports drinks and icky-sweet gels. Not only does this cut down on the intake of added sugars, it can also make things easier for the gastrointestinal system, which suffers less distress when not overloaded with sugars – some of which get fermented, causing unpleasant bloating – that need to be digested while the body is working hard. The result can be a happier stomach and, in some cases, a healthier athlete, when hundreds and thousands of grams of sugar are removed from the training and race-day diet. I don’t have a problem helping an athlete switch from carbs to fat as fuel. 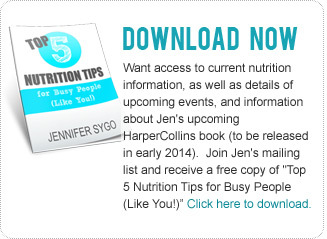 I have clients I work with who are on low-carb, high-fat diets, and they love it. Many have had great success and set personal bests with it. And for athletes who are overweight, at risk for type 2 diabetes, there is evidence that a low-carb, high-fat diet might be the best choice for overall health and weight control. But that’s where context comes in: low-carb, high-fat isn’t for everyone, nor should it be for all types of athletes. 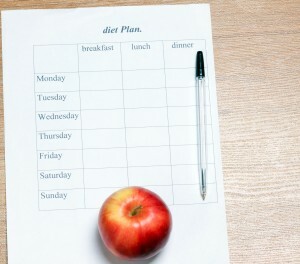 The athletes who do well with low-carb, high-fat diets typically do steady-state endurance work. And while a growing number of top ultramarathon finishers are low-carb, high-fat followers, they still fall into a different category than rowers, basketball players, tennis players, and sprinters. (If you want to learn more about this debate, read Dr. Asker Jeukendrup’s recent blog on the topic versus this piece from Runner’s World, featuring low-carb, high-fat advocate Dr. Tim Noakes). For healthy, competitive athletes for whom top speed, or bursts of speed, is essential, consuming carbs before or during important training sessions and competition still makes sense. And, it would seem, if you want to have a shot at a world record in the marathon, then you’d better learn to love the taste of sports gels – black currant sounds like as good a choice as any.